Tireless hunters who have adapted to survive for millions of years, sharks provide a crucial function in our ocean ecosystems. Yet today, many shark species are endangered as life in our oceans comes under threat from climate change and pollution. Sharks offer a unique way to look at the health of our oceans, and to explore the role that our oceans play in the health of our planet. You’ll learn about oceanographers here at the University of Arizona whose cutting-edge research helps us understand how the world’s oceans connect to our atmosphere and climate. In perfect combination with the new exhibit, Flandrau will also debut a new fulldome planetarium show, Great White Shark, all about great whites – the one of the biggest sharks in the seas and the popular predator in so many scary movies. Adapted for the planetarium’s immersive fulldome format from the IMAX format, this incredible show takes you up close with these “monsters” of the deep. To make this film, divers swam with great white sharks at locations all over the world and recorded them up close, so that you’ll feel like you’re swimming with the giants in the safety and comfort of your planetarium seat. An awesome sensory experience, Great White Sharkwill leave you thrilled, and wiser, as you learn about the creatures we love to fear. Most of us wlll never experience a direct encounter with a shark, and yet they capture our imagination. We share our planet with these magnificent creatures and, thanks to science, we now understand sharks not as a menace, but as part of the complex web of life that makes Earth so special. 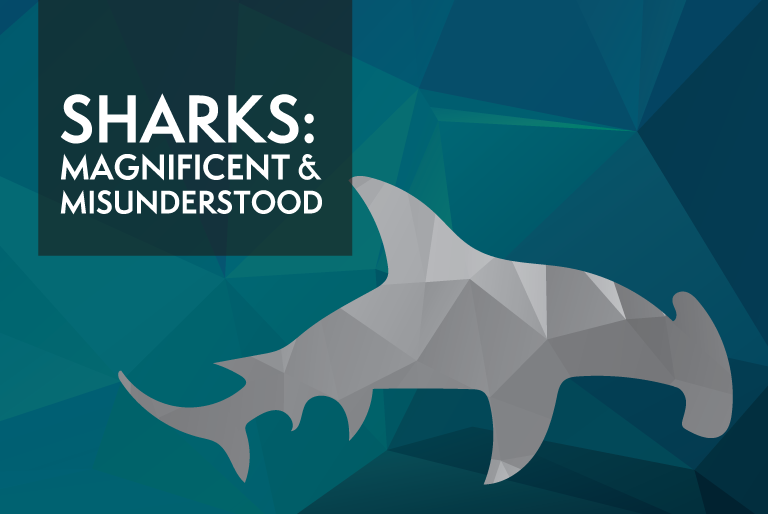 Come explore the science of sharks in this fascinating new exhibit, Sharks: Magnificent and Misunderstood, and see the new planetarium show Great White Shark, now open!